Description: The power for the NS H81 on Ford lead off the Pascack Valley Line. Description: An NS local passes the Lancaster station on its way to the New Holland Secondary. 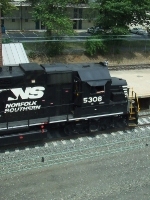 Description: Typical Norfolk Southern; two GP38-2s and three ballast hoppers. Description: Sorry its unlevel. I still have to work on level shots. It's kind of hard, though, when it's rolling at 40MPH. Description: Things didn't go too well on the CSX(missing two trains at the same time; what fun! ), so this is what NS is doing, which is what is usually being done on a Saturday morning-absolutely nothing! Description: Edgemoor Yard power rests for the weekend. Description: NS 6758 (CR 5646), 9407, 5308 (CR 8125) 7514, & NS 8365 (CR 6136) are seen on 36A at Newark DE on 9/13/10. Description: Taken whilr doing close to 70 mph while riding Amtrak. Description: Soon-to-be 37A power on the left, and NS Edgemoor Yard assigned engines to the right. Description: H5M shifts a short string of autoracks at Edgemoor Yard with a single ex-Conrail GP38-2 at 1652. Description: Edgemoor Yard at 1652. Description: Switching autorack cars at Edgemoor Yard.